You can visit the nation's capital without destroying your budget. As with most tourist meccas, Washington, D.C. offers plenty of easy ways to pay top dollar for things that won't really enhance your experience. With a bit of knowledge and pre-planning, your trip to Washington, D.C. can be kept within your travel budget. While there are fantastic events and seasons when everyone wants to visit Washington, D.C., consider avoiding these higher-priced times in order to save money. If you opt to visit during these peak times, there will be other ways to cut the costs to balance things out such as budget dining and free attractions. One of the most popular times to visit Washington, D.C. is Cherry Blossom Festival time in spring when temperature and humidity levels are not yet uncomfortable. The majority of blossoms are located near the Tidal Basin and along the shoreline of East Potomac Park. There are also blooming cherry trees dotted around the Capital Mall. Spring break is also a popular time for families to visit and Washington, D.C. can get quite crowded. Summer is the season when most tourists come to town. It gets crowded and the weather is hot and humid. Independence Day is a popular time to come to the District. You'll enjoy an all-American, patriotic Independence Day with the National Independence Day Parade in the morning along Constitution Avenue NW, and then in the evening find a spot to watch the fireworks. Autumn can be very enjoyable, too, because of the mild weather. Most of the children have returned to school. Fall is a great time to take in a Washington Redskins game and enjoy the stunning fall foliage. Winters are mild compared to interior America, but snow and cold arrive nearly every year by January. Holiday decorations, especially the National Christmas Tree, is a draw. There are also tours of the White House where you can see the holiday decorations. So, to stay on a budget, it is wise to avoid the peak times when major events occur and tourists crowd Washington, D.C. Shoulder season is always more budget-friendly and winter may be cold, but there won't be as many visitors so prices will go down except during the holidays. Going during the week may make your hotel stay more affordable. Politicians and government employees flee the city each Friday, and business people are on their way home, too. As they leave, your chances for finding manageable traffic and low-cost hotel rooms will increase. Shop for flights to Washington. It really pays to check Washington room rates prior to your trip. Websites such as Priceline and TripAdvisor can help you find some good prices along the Mall or near Reagan National Airport for a fraction of the rack rate. Be certain your hotel is within walking distance of a Metro stop. When it's not rush hour, taking the Metro into the District to enjoy the sights will be a fun, and reasonably-priced way to tour. There are less-expensive hotels located throughout the city. As an example, you can stay at a AAA Four Star hotel for about $210 per night—the Kimpton Mason & Rook Hotel on Rhode Island Avenue between Logan and Scott Circles. If you are traveling with family, the all-suites hotels are ideal and most all include breakfast and, at a minimum, refrigerator and microwave in the rooms where you can heat up leftovers or make a simple meal. If you want to find reasonably priced food in Washington, think like a college student. 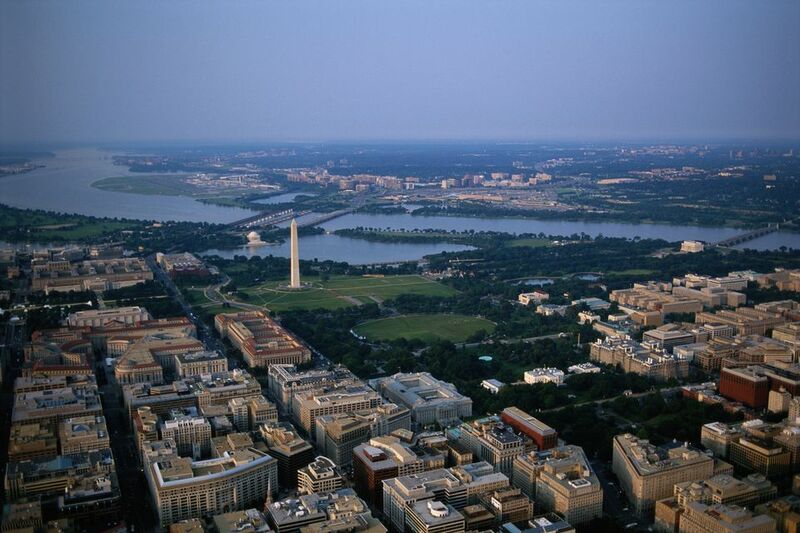 Many visitors forget that this the Washington, D.C. area is one of America's premier college towns. Restaurants near the various campuses must keep their prices within reason, and many cater to the cosmopolitan make-up of those student bodies. Check out the Washington Post's best cheap eats articles for some ideas on where to find good food at a great price. If you are visiting the National Mall, note that the museum cafes are expensive and often crowded but are the most convenient places to dine on the National Mall. There are a variety of restaurants and eateries within walking distance of the museums. Airport trains make ground transportation cheaper in the District. It is possible to fly into Washington and see everything on your itinerary without renting a car or stepping into a taxi. The excellent Metro system delivers you from Washington airports to your destination with minimal expense and solid efficiency. During peak hours, most fares range from $2.25 to $6 per trip. During off-peak hours, fares typically range from $1.85 to $3.85. Metro riders must pay via SmarTrip card. It's good at peak commuter times. SmarTrip Deals & Discounts is a free program. Show your SmarTrip card at participating museums, restaurants and stores around the District, Maryland, and Virginia service area to get discounts on admission, dining, and more. If your itinerary is complicated or shaped by business needs, shop for car rentals carefully. One of the greatest things about a visit to Washington is all government buildings, Smithsonian Museums, memorials, and monuments do not charge for admission. You will spend valuable time in lines, so prioritize carefully. For a good list of Capitol Hill planning links, visit House.gov. Requests for free public tours of the White House must be submitted through a member of Congress and are usually approved about a month before the planned visit. Tours form in groups of 10. 50 Free Things to Do in Washington, D.C. includes the National Botanical Garden, the African-American Civil War Memorial and Museum, the Bureau of Engraving and Printing 30-minute tour, free concerts, and art museums. The Cultural Alliance offers half-price, day-of-show tickets to the public. There are many fine events on Washington's cultural calendar. So many cultures are represented there, and their finest representatives often consider Washington a must-stop on any U.S. tour. It's also worth checking with the Smithsonian Institution for a schedule of their cultural offerings during your stay. There are some great places to visit in the surrounding area for a quick day-trip. If heavy traffic and big-city noise get you down, you might want to trade a day in the nation's capital for a day in Maryland's compact and walkable capital of Annapolis. It's a 35-mile drive from Washington. Annapolis is a beautiful small city that is also home to the U.S. Naval Academy. A fascinating tour of the academy is available for $11(discounts for children and seniors), and walks through the city's historic district are a treat. The National Zoo is part of the Smithsonian Institution but is often overlooked as visitors plan their trips. Admission is free. On the Virginia side of the Potomac, Alexandria and Arlington offer some pleasant shopping areas and historic districts. About 40 miles to the north, Baltimore offers the Inner Harbor, Fells Point, the National Aquarium, and Fort McHenry.